With race organisers making the bold (yet correct decision) to prioritise rider safety when cancelling Stage 5, we move swiftly onto Stage 6 with an ever greater scope of riders still in contention for the overall win than expected by this point. 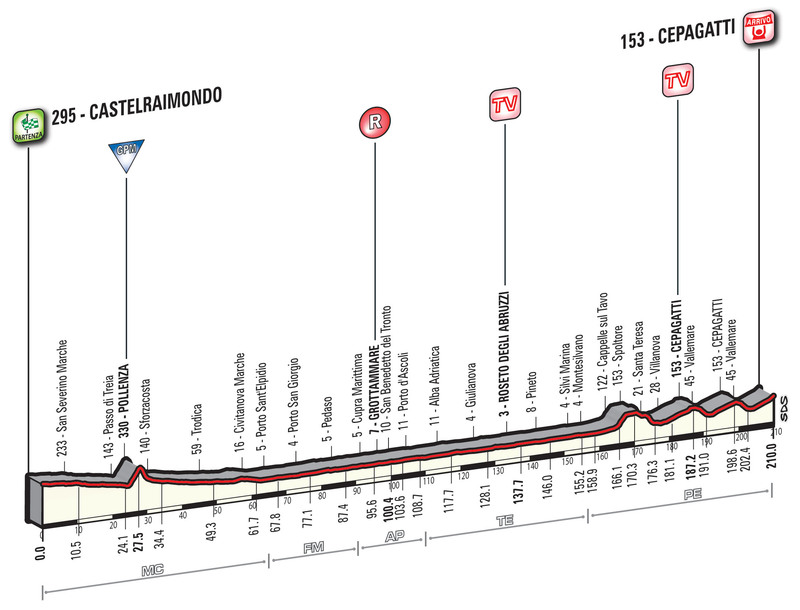 The penultimate day is a 210km stretch from Castelraimondo to Cepagatti and is likely to encourage several of the well placed sprinters and strongmen on the general classification to try and gather a few bonus seconds ahead of the final time trail by winning Stage 6. The day as a whole is very simple, but the rises in the final 35km will be noteworthy, as well as a uphill battle to the line. Peter Sagan has so far managed to avoid winning a stage here with great aplomb, but today’s challenge surely looks tailor-made for his abilities. With a 200km+ distance and some lumpy terrain late on, the reigning World Champion must feel confident of powering away from the rest of the contenders on the rise up to the finish line. A certain rival on this occasion will be Fernando Gaviria, the young Colombian being in great form right now and appears to dominate this type of uphill finale with great sucess. Caleb Ewan is one of the fastest in any race and is certainly the man to beat in a drag race here, but this final incline will blunt his speed somewhat, though Stage 3 demonstrated that this still results in a ferocious turn of speed. Moreno Hofland saw his team fumble the leadout on Stage 3, but will once again be a contender today if everything goes to plan on this occasion. With only the time trial remaining after this, Greg Van Avermaet could well fancy stealing bonus seconds by winning the stage and help cement BMC’s chances of winning this race overall alongside teammate Tejay Van Garderen. Posted on March 14, 2016 by Spokenforks	This entry was posted in News and tagged 2016, BMC, Caleb Ewan, Etixx-Quickstep, Fernando Gaviria, Greg Van Avermaet, Moreno Hofland, Official, Orica-Greenedge, Peter Sagan, Preview, Spokenforks, Stage 6, Team LottoNL-Jumbo, Tinkoff, Tirreno Adriatico. Bookmark the permalink.